As a part of Momentum Tulsa, three artists received $1,500 Momentum Spotlight commissions to create new artwork. The Momentum Spotlight artists receive cash commissions and three months of interaction with the guest curators. Selected Momentum Spotlight artists are Brian Letzig of Stillwater, Jacquelyn Sparks of Oklahoma City, and Jessica Tankersley of Norman. For Tankersley’s Twitter Heart project, she is creating an electronic sculpture that will appear to have a life of its own, with a rhythmic beat similar to a heart. The sculpture’s “heart beat” however, actually depends on the word “heart” appearing on the social networking site Twitter. If no “heart” tweets are found, the sculpture will cease to move. Tankersley is a student at OU, studying Media Arts. Read more about the Momentum Spotlight projects in the Sept/Oct issue of Art Focus Oklahoma. Momentum Tulsa opens Saturday, October 8 from 8-Midnight at Living Arts, 307 E. Brady, Tulsa, featuring live music by The Parakeet Chiefs and DEERPEOPLE. Tickets are $7 in advance and $10 at the door. The exhibition will remain on display through October 27. More information at www.MomentumOklahoma.org. Sparks is incorporating research on her family history to tell an unbelievable story. Reconstructing Charles Proctor is a photographic project which illustrates the story of her mysterious grandfather whose work took him around the globe, leaving behind clues and artifacts that are helping the artist piece together his life. Sparks is a student at OU seeking a master of fine arts in photography. Letzig’s project The World We Live In includes video contained in house forms, with the video imagery illustrating juxtapositions experienced in everyday Oklahoma life. The multimedia installation incorporates both sides of his studies at OSU: ceramics and architecture. Q: Tell us about your subject matter. Trami Thi: The cacophonous, mechanical sounds of cars honking and breaking as they line up amidst one another during traffic hour is what drew me to paint these structures to communicate the loneliness and isolation of the human condition. In this century, there is no denying that cars have become an essential part of American life, representing the need for technological advances to represent a more effective and efficient lifestyle. Living in urban environment I cannot help but noticing that though people are all living within close vicinity of one another, there are invisible boundaries that keep people apart. Questions arise as to what people seek in one another. Because of growing technological advances, people are able to eliminate things in their lives that are not useful. In my car series, I seek to find ways to visually simulate human psychological states through investigating cars in the natural states they are found. Q: Why oil on paper? Thi: In “Portrait of a Parking Lot”, I wanted to capture the continuous rows and rows of cars stretching in a never-ending directions. Each car had a designated space within a yellow painted line represents people’s fear of intimacy. 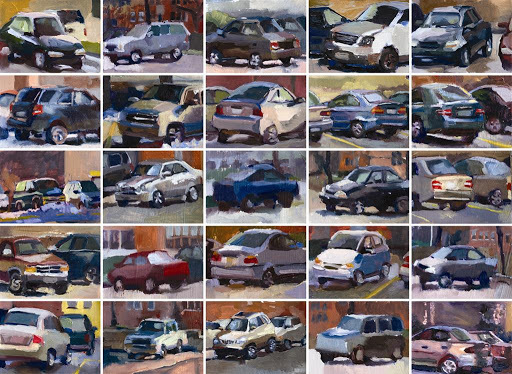 I made it a point to return to this parking lot to make an onsite painting of every car I see. I paint on paper because it is lightweight and easy to transport for painting on site. 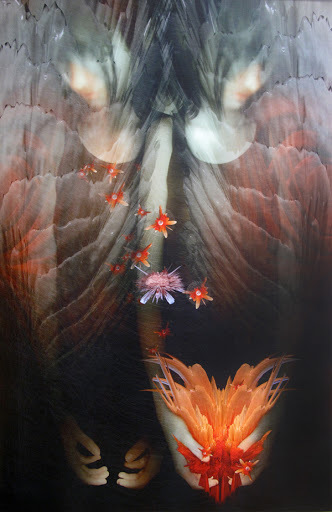 Trami Thi was born in 1988 in Oklahoma City. She started her fine arts studies at Oklahoma City University. She moved to Baltimore, MD to complete her BFA from Maryland Institute College of Art. 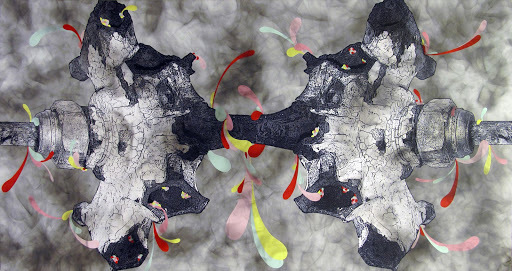 Although she works mainly in oil paints, she also works with sculpture, printmaking, and installation. She has displayed work in Baltimore, MD; Brooklyn, NY; Estelli Nicaragua; Limay, Nicaragua; and Oklahoma City, OK.
Next Thursday, September 29 from 5:30-7:30, OVAC will host an Artist Survival Kit workshop on Artistic Collaborations. The workshop will be held at the University of Oklahoma’s Art Department in Norman. OU’s visiting artist duo Satan’s Camaro will speak, along with Oklahoma City artist Harvey Pratt. Each will share about their experiences working collaboratively – including the benefits and challenges it brings. Satan’s Camaro is a collaboration between artists Lenore Thomas and Justin Strom. Their collaborative work can be viewed at www.satanscamaro.com. To see their works as individual artists, visit www.lenorethomas.com and www.justinstrom.com. Visit www.ArtistSurvivalKit.org for more workshop information and registration. 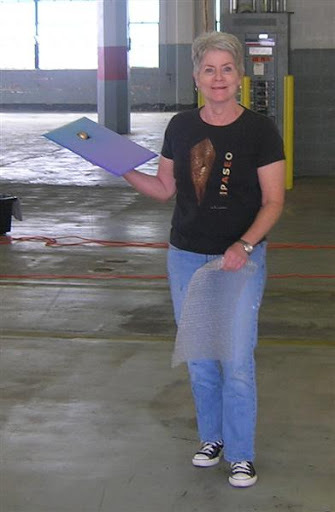 For more than 20 years, Sue Moss Sullivan has helped lead the 12×12 Art Fundraiser along with many other community events we enjoy. She has been active with countless arts events and social service organizations, serving artists and the community broadly. Besides participating as an artist since the 12×12’s inception, Sullivan has recruited many audience members, sponsorships, and donated. She has worked hands-on to make the event happen, literally helping hang each grouping of artwork. She served on the Oklahoma Visual Arts Coalition (OVAC) Board and as President and interim Director in a pivotal time. 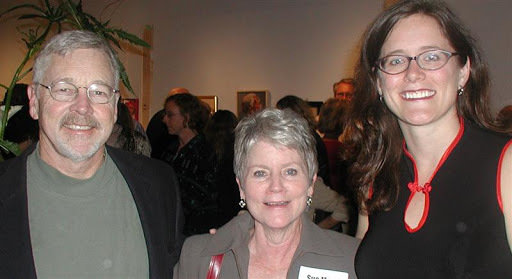 Sue and her husband Andy are the Honorary Chairs of the 12×12 Art Fundraiser on October 1. I interviewed her to understand better why she dedicates herself so much to volunteering amidst her busy fiber art practice. Q: Why did you start volunteering and getting involved with the arts community? SMS: It took me until later in life, after teaching in the 1960s, I took a photography class and my interest grew from that. I was happiest making art. Before I joined OVAC, I’d done other volunteering for things that were important to me like Planned Parenthood and Parent’s Assistance Center. I started focusing on what is important to me, trying to develop my fiber art and studio. Plus the community I’ve found, the social and personal community, has enriched my life. I’m not serving officially on any boards right now, but I try to volunteer when I can and try to support financially when possible. Q: Why did you get involved with the Oklahoma Visual Arts Coalition? SMS: The Oklahoma Visual Arts Coalition has helped make art much more visible in Oklahoma. Also with the redevelopment of Oklahoma City, people seem to be looking for art now. Everything the OVAC does is so positive and made so easy. The staff has worked hard to get other volunteers involved, especially the next generation of leaders. I think that’s how all nonprofits should work; it makes it easier for everyone. When I got involved, then OVAC director John McNeese had the idea for the 12×12 event, which I thought was genius. It started small, but I could see it growing. Q: How do you balance your studio time and your community leadership? SMS: Now I have time to manage both. I plan ahead, like I know I want to help hang 12×12 because it’s so fun to see every piece hands-on. It enriches me so much. I go back to the studio and it makes me more productive. It’s a stimulating thing for my personality. For your life’s work, do what you love to do. I know that doesn’t work for everyone, but it does for me. In studio, we keep an open and strong presence on the street in Paseo [See Studio Six]. We have been a part of the area as it has been redeveloped. The other artists in our studio and I know the value of people seeing how and where we work. Q: What is it like to have art in your home on an ongoing basis? SMS: You can enrich your home and life with the art you purchase. Art can soothe you, bring back important points of your life, and evoke memories. First of all art should challenge you to think. You don’t have to like it on initial viewing. If you stand for more than a couple of minutes, you might see something that will make you think. You might ask why that artist painted that landscape differently or that sculptor made abstract shapes. If it doesn’t evoke emotion or challenge, then it hasn’t done its job as far as I’m concerned. Art in our home holds an important part of our life. We have small hand-woven rugs from around the world. When they are sitting in our home or people ask about them, it reminds us how fortunate we’ve been to get to travel. I’m proud when visitors from out of state come. They admire the art in our home and find out most is from Oklahoma artists. View and purchase artwork by 150 Oklahoma artists October 1, 2011 at the 12×12 Art Fundraiser. Buy tickets, read more and see pictures at www.12x12okc.org. Learn about volunteering with OVAC here. Q: Tell us about the inspiration for of your 12×12 piece. 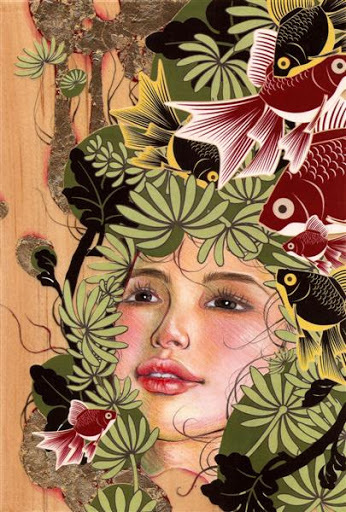 JUURI: My inspiration was Japanese imagery in the goldfish and deep-sea plants. You might see these types of traditional designs on kimonos, or on other fabrics. I usually do a beautiful female face, and incorporate those types of elements around her. Q: How did you execute it technically? JUURI: The face is acrylic + colored pencil on wood. The plant and fish pattern I laid out digitally, printed, and collaged onto the wood. There is also gold leaf in the piece. Q: In what upcoming venues might audiences be able to see your work? 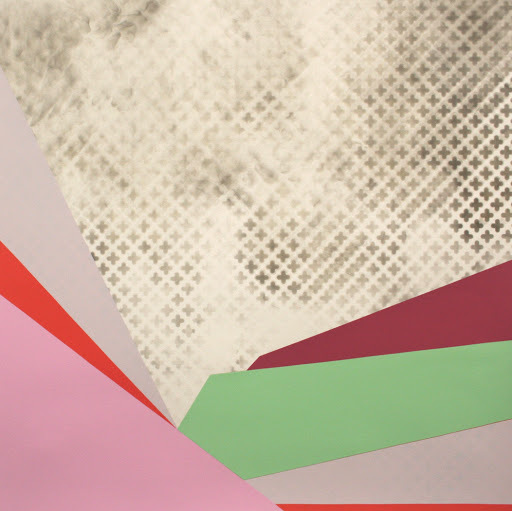 JURRI: I am scheduled to have a show in 2012 at DNA Galleries in OKC. I also try to expand my horizons by joining many group shows in Los Angeles and other big cities. I also have a special event coming up in Norman in summer 2012, but it’s still under wraps! View and purchase artwork by 150 Oklahoma artists October 1, 2011 at the 12×12 Art Fundraiser. Buy tickets, read more and see pictures at www.12x12okc.org.